Window blinds and shades are two of the most popular window treatments for French doors in the Norco area but did you know you can get shutters for your French doors? It’s true! With so many different window treatments available today, it can get a little overwhelming to choose the perfect ones, especially when you’re trying to fit an odd shape like a French door with a handle. If you want to add a little privacy to your home but don’t know which type would work best, read these tips from Luv R Blinds about how to choose modern window treatments for French doors. If you need further help in the Norco, CA area, call us for a free in-home design consultation! They can be fully or partially opened and closed for flexible privacy control. The match the other window treatments in the house. They come in a variety of materials and styles to enhance the design of the home. They need to be anchored because they flap when the doors move. They also need to be installed with cutouts for the door handles and this can be tricky. A deep headrail sticks out from the door by several inches so a smaller headrail needs to be used. They work with just about any décor because they come in a huge range of styles, colors & textures. Most (but not all) only offer you a limited way to control light and privacy – either open or shut. You can’t see who’s at the door or view outside the home with some window shades. Unless they’re motorized or installed on a track, window shades flap against the door. Shutters are most definitely a contender as a window treatment for French doors! The smaller width slats work best for doors because they don’t get in the way. 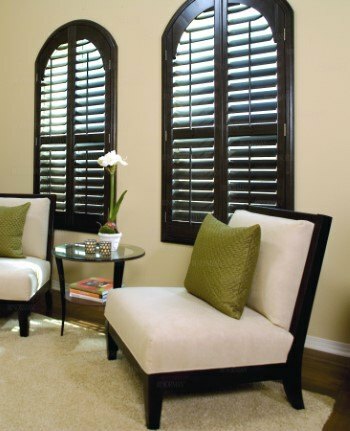 Shutters come in 1” widths and are made in real wood and faux wood styles. 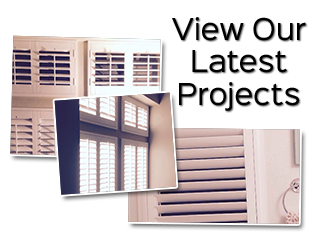 Modern shutters offer clean lines and an amazing contemporary style for the home. They come in beautiful wood stains and paint finishes. Good brands are strong and durably made with superior hardware. They offer flexible privacy and light control. They do need to be custom fit to accommodate the door handles. Shutters offer a more limited design style for the home, looking best with crown molding and tall baseboards. Shutter panels on French Doors are fixed and can’t be opened. Unless you plan to do the cutouts for the door handles yourself, custom window treatments are the solution. They’re made to fit your French doors at the factory based on specific measurements your shutter company provides them with. At Luv R Blinds, our custom shutter company measures the opening for you and we ensure a perfect fit with our professional installation. This gives you a high-quality set of shutters that perfectly fit your French doors. Many people choose motorized window treatments for their French doors. Controlling the light and privacy by pushing a button whether you’re home or not is wonderful. These smart window treatments can be controlled with a phone app! Custom window treatments are motorized for you. All you have to do is let your design consultant know you want them! If you are looking for window treatments for your French Doors in Norco or the surrounding area, give us a call today at 951-736-9650 or fill out our online request form.